I've been getting to work really early lately. Part of it is being super-busy, which I love, but part of it is that I love being in the office when it is so quiet. This morning I can hear the rain pounding on the roof. We're on a downhill slide into fall here in Anchorage. I've been meaning to take pictures of the transformation, which include a flock of Canadian geese gathering on the mud flats near my house and the blooming of the fireweed. Alaska legend is you can tell how long it will be until winter by when the fireweed finishing blooming and then goes to cotton. For the first time in a couple of weeks, I was home to make dinner last night. On Golden Pond is fully blocked and going well, but the nights we aren't in rehearsal I'm usually staying late at work or running the errands that I haven't had time to do. Last night I was determined to make something delicious, simple and packable to take to work for lunch. I am fascinated by the Italian concept of cucina povera--literally, poverty kitchen--not because of the financial aspect of it (we are fortunate in that regard), but because it means you make a delicious dish from basically nothing. This dish is so simple that I kept wanting to do something more with it, like adding anchovies, chicken sausage or olives. In the end, I left it proudly unadorned, the way it was meant to be. 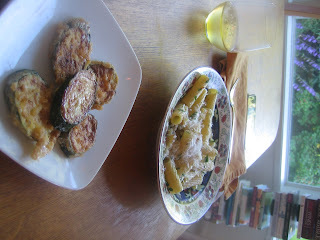 It originated in Puglia, the single food region I most want to visit in Italy and haven't had the opportunity to--yet. 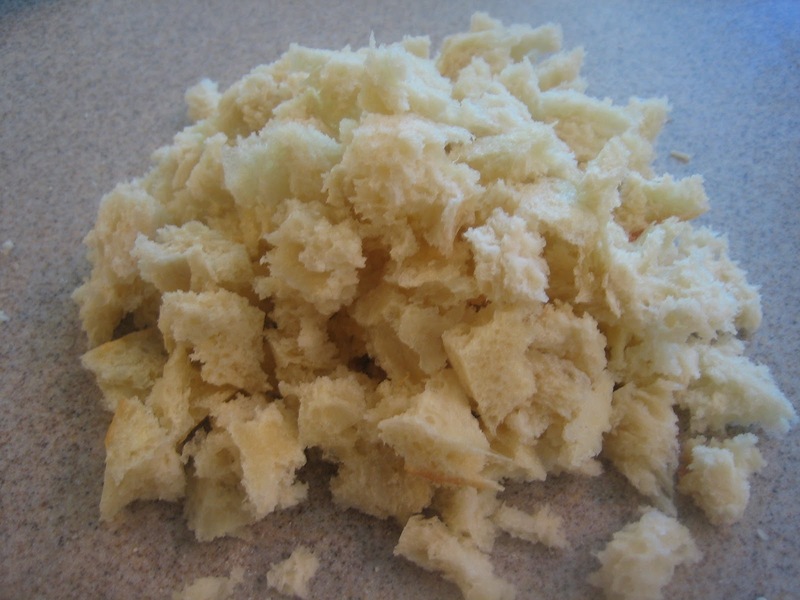 Trim the crust from the bread and then pull it into crumbs with your hands. The crumbs should be various sizes. Start a large pot of water to boil for the pasta, adding at least a tablespoon of salt. In a large skillet, heat the olive oil. 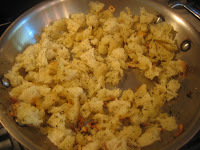 When it is shimmering, add the bread crumbs and garlic. 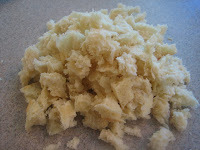 Toss the crumbs to coat them with the oil, and toss occasionally when cooking so that they brown and crisp. When the water is ready, add the pasta and cook for about nine or ten minutes, until the pasta is al dente. Reserve half a cup of the pasta water and drain the pasta thoroughly. Then add it back to the pot and cover it until ready to use. The crumbs will be ready when they are lightly golden and crispy--make sure not to scorch the garlic. Toss the pasta with a little of the cooking water to coat it. Add the crumbs, parsley, peperoncini and Parm to the pasta and toss thoroughly. Season with salt and pepper, then drizzle with good-quality finishing olive oil and toss again. Serve with another grating of Parmesan. Makes six appetizer pasta servings or four generous main course servings. I served this with a side of fried zucchini and a bottle of dry, minerally Gruner Veltliner. So glad this brought back good memories for you! Did your nanna use peperoncini? That was a revision I made from the original recipe because I thought it would add a little color/spice. I loved it but am not sure how authentic that addition was. This looks delicious. Isn't it surprising how sometimes the best dishes are the simplest? 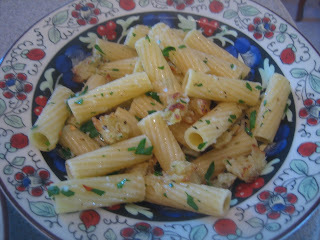 I hope you (and I) get to Puglia someday! Just had to add that I ate leftovers of this for lunch today and it was so good! The crumbs weren't quite as crunchy, but the flavor was tops. Simple and cheap is sometimes best. I would have a hard time resisting too with a couple of additions but good to go straightforward a first time. Something along the line of cucina povera I really enjoy is the tomato bread soup. YUM! I agree with previous comments... simple and inexpensive can really surprise you.. because that's when you get creative and also stick to basic flavors and fresh stuff... yum! From meager means comes some great dishes. This sounds delicious! Glad the play is progressing. Oh my. I can't get over how simple and delicious this looks. "Poverty Kitchen?" Could've fooled me. This looks so much better than the wimpy dinner I had! I've been looking for dishes like this to make after work in the evenings! I just added this to our menu next week! Am so looking forward to your autumn taking sway whilst magnolias and cherries are madly blooming down here and nesting birds are angrily swooping down on passers-by too close to their nests . . . I too have become very interested in the cooking of Puglia: a number of our TV foodie shows have hovered around the area just recently, and, yes, this dish was one on the 'show and tell'!! I used to go to work early too, so that I can get most of my work done before everyone gets to work. I had no problem getting up early back then...until the past year I started blogging and lots of late nights and my exhaustion from being with the kids give me hard time waking up! Anyway, I love Italian food because of simple cooking. 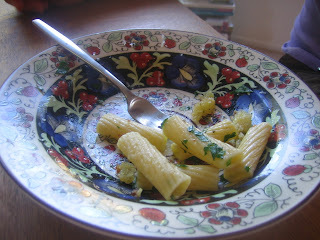 Never had Rigatoni with Bread Crumbs and Parmesan and I'd love to give it a try. Some of the best meals are simple. I love getting to work early, I find that I am much more productive. I hope this reheated well for lunch. The simplicity of the dish makes it so appealing. I love this type of chubby pasta and love the simplicity and elegance of this dish...I hope you're having a fabulous start to your weekend, my friend!!! Something new but why not. After all, simple food keeps me going most of the time and what great way to use up bread slices. The next round with bread slices will be this easy but looking really good recipe. This is a great "there's nothing to cook" meal at our house too. It always comes out looking and tasting special. this is a lovely pasta dish, cannot wait to try this! Glad the play in coming along well! This is how I love my pasta dishes too! Yummy! I've never had a pasta with toasted breadcrumbs! It looks delicious and a relatively easy dish to make. Love it! Congratulation that On Golden Pond is booked!!! I bet you feel good about that! Well done with the On Golden Pond. I'm ready for you to start bringing your shows to Cayman! Congrats on the fantastic booking! Even cucina povera in Italy has so many things to offer! The dish looks absolutely mouthwatering and sure it is a good way to welcome autumn! I love getting up early too and getting a few things done before my kid is up. I like my little quiet time. This pasta dish looks yummy! This is lovely, I like how it's making something delicious from nothing. My kind of food. I love simple pasta dishes but I've never had this one. It looks wonderful, though, so I'll have to try it. I must say, your life in Alaska does sound interesting. The key to simple (and delicious) pasta dishes is incorporating only the freshest ingredients. Fine olive oil, ripe tomatoes, and a quality cheese can be more than enough to satisfy the palate, stomach, and soul! I love simple pasta dishes. This looks delicious! I love warm simple pasta dishes, the crunchy bread crumbs sound so good on top :) Making me so excited for cool fall weather and warm meals! My husband and I have this dish on Christmas eve but sauté garlic and anchovy paste in the olive oil to toss with the pasta and bread crumbs. It is been a tradition in his family for years. The one thing I find 'poor foods' have in common is that they are so damn tasty! Making this. p.s. I love it that you are able to squeeze enjoyment from those busy busy days with those moments of quiet before everyone gets to the office.